This is something that’s great to try before your doctor attempts an ECV (external cephalic version, in which the medical team manually tries to move the baby)- it’s gentler and can feel quite relaxing. Even if you’ve already tried ECV without success, moxa can be helpful. Keep in mind, sometimes there’s a very good reason the baby won’t ever turn, and although it’s easier said than done, try not to get too stressed about the outcome- strive to find a balanced place between doing everything possible (see www.spinningbabies.com for more ideas) and giving up control over what happens. In 2013 I wrote a post detailing the basics of how moxibustion (also called “moxa”) is used in Chinese Medicine to turn breech babies (click here to read it). I’ve learned so much on the topic since then, especially since beginning an intensive 2 year mentorship program which is completely focused on prenatal acupuncture care in 2017. I’d like to thank the mentors in this program for compiling so much of the data you’re about to read and for sharing their experiences which I am privileged to pass on. I feel this is some of the best and most complete information out there on the topic-please feel free to share this with your doctor, midwife, doula or pregnant friend or family member! Breech is fairly common before 28 weeks’ gestation, but most babies eventually turn to a cephalic (head-down) position as the pregnancy progresses, with 7-15% breech at 32 weeks and 3-4% at birth (source). About 40% of babies that are breech at 34 weeks end up turning on their own, but the data recorded by one of my mentors while working in a hospital maternity unit over 24 years and with hundreds of women showed that using moxibustion increased this rate to 60%. What is Moxibustion? How Might It Help? 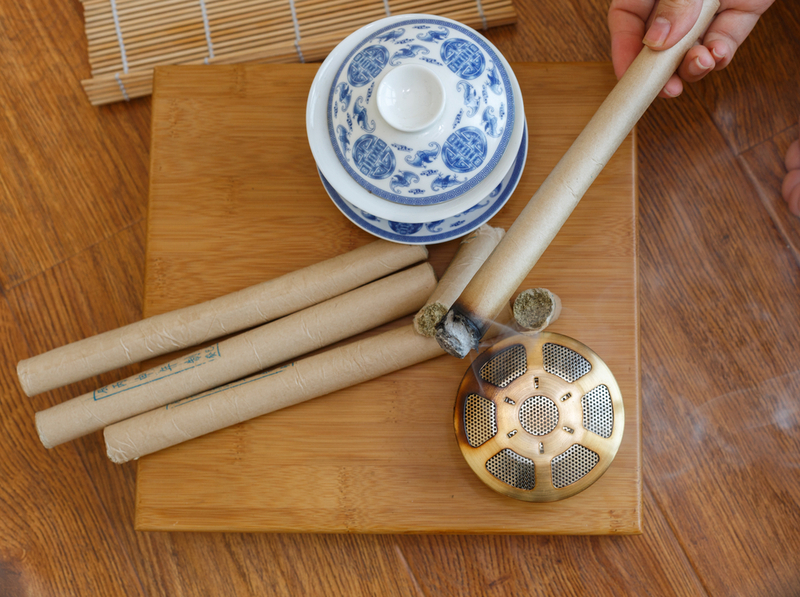 First, just a few basics- what is moxibustion? It involves the burning of Mugwort leaf (Artemisiae argyi, or Ai Ye, as it’s called in pinyin Chinese). The Mugwort is tightly compressed into a cigar-like shape and then lighted, so it’s smoldering and slowly burning. It’s then held a few inches away from areas of the body or specific acupoints in order to stimulate them. In this case, there’s a point on the pinky toe which is warmed, for about a 10 day period, 15 minutes per day. It may sound a bit “out there”, but stay with me! While we don’t know exactly what this does to turn breech babies, there have been animal studies in which the technique was found to increase maternal cortisol levels (increasing fetal movement) and promoting relaxation of the uterus muscle (creating more space for the baby to move). Moms usually report that the baby is very active during moxibustion! Who Should Try Moxibustion and Acupuncture for Breech Baby? Women and their partners who are very motivated to turn the baby and avoid a c-section- you will not return to your acupuncturist every day for 10 days for the moxa, you will be taught how to do it at home on your own, so this does require some time commitment. If you’re in the NYC area, please do contact me to discuss if this is a good option for you as close to 33 weeks as possible, so that treatment can begin at or just after 34 weeks if needed. If you are past 34 weeks, it’s not too late- but let’s schedule a phone consultation to discuss your circumstances and decide whether or not to try to turn your baby. Above all, know that it’s wonderful that you’re willing to do everything possible to try and turn the baby and have a vaginal birth. There are only 8 randomized, controlled studies included in this review, and one issue is that the frequency and length of time moxa was given varies quite a lot between studies. The other issue is- how many weeks along is the mother? In these studies, it was between 28-37 weeks. Babies have a higher rate of turning on their own, without any intervention before 33 weeks, and after 37 weeks a much lower rate, especially for first time moms (there isn’t as much room in the uterus). The standard recommendations of expert practitioners are to start moxa treatments ideally at 34 weeks, between 34-36 weeks if possible, and to perform moxa for 15-20 minutes once daily for 10 days. I also combine this with two acupuncture sessions, once at day 1 of treatment and another 4-5 days later. If we could standardize this protocol, it seems the research would be of much higher quality. Thank you so much for this article. I have recently had to turn away a good client because in the UK it is now considered a red flag to turn twins with moxa. I was surprised by this because I was always taught in my training (20 years ago ) that we can use moxa for twins if they are in separate sacks and it is the presenting twin as breech. It is difficult to get any more information on why this is now not recommended in the UK. Have you had success turning a twin in this situation ? Have you ever had a problem? Hi Natasha, Thanks for your question. I am not certain where this recommendation would have come from- any ideas? From the NHS or an acupuncture organization? To my knowledge, the two considerations you mentioned are most important- the babies are in separate sacks and presenting twin is breech. As long as there are no other complications with this pregnancy I am unaware of any research or evidence showing moxa would be a problem. Please let me know if you find any further information. Thank you!